Tower of Pizza - Mont-aux-Sources Accommodation. 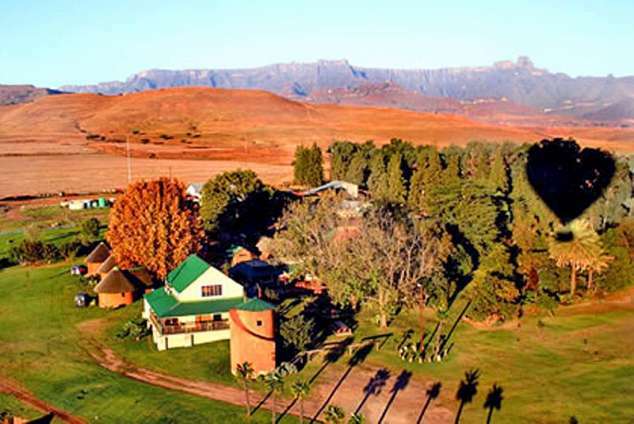 Visit this famous landmark and experience traditional farm style hospitality in close proximity to all major attractions in the Amphitheatre valley,Northern Drakensberg, KwaZulu-Natal. Artistic and off beat décor complement the tranquil and natural beauty of the area. Tower of Pizza is 10km from the Royal Natal National Park which is in the Okhahlamba Drakensberg World heritage site. Situated on a working grain farm of 2000ha, this family owned business has been running for the past 20 years. Tower of Pizza's restaurant offers scrumptious meals including the famous traditional wood burning oven pizzas, homemade pastas, tramezzinis and other Italian food. Two thatched cottages with shower and one bedroom (one double bed and two singles) - maximum 4 guests. Two thatched cottages with shower and one bedroom (one double bed and one single) - maximum 3 guests. Two cottages with shower and one bedroom (one double bed and one single) - maximum 3 guests. These two units each have a log fireplace, small fridge and microwave. There are tea and coffee facilities in the rooms and bath towels are provided. 46464 page views since 05 Jul, 2006.